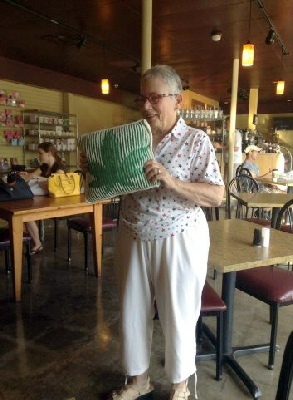 Here is a photo of a pillow I knitted for a contest at Knitting Camp last month. The theme of the contest was "My Secret Garden." We could interpret the theme however we wanted to. I thought something in illusion knitting would suit the "secret" part of the theme. I had to create an illusion knitting pattern because I couldn't find one online. Possibly, I didn't look in the right places. I did find a pattern for a hat with a marijuana leaf in intarsia, but I wanted no part of that. At any rate, I decided it was time to try to make a pattern. I found a JPEG of a marijuana leaf online and put it into an online knitting chart generator. Then, I wrote out a pattern (row by row) for knitting it according to principles of illusion knitting. Since I had never smoked pot, it was a challenge and also fun. Someone at Camp told me, "Of all the people in this room, you're the LAST one I'd have thought would have knitted this." This photo was taken by a knitting buddy in a local coffee shop where we meet on Saturday mornings. I thank you both for making me love illusion knitting.